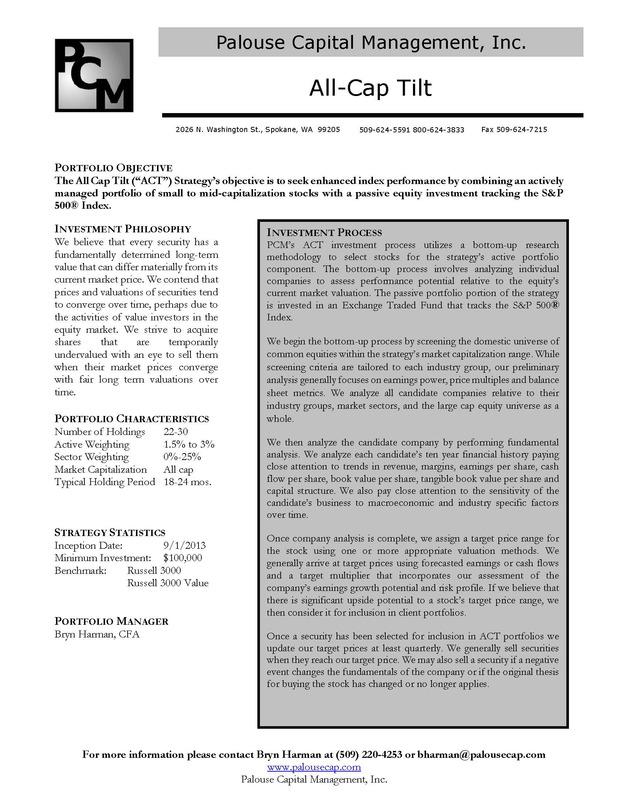 PCM’s All Cap Tilt (“ACT”) strategy uses a mix of large cap passive investment vehicles and actively managed small to mid-cap equities to achieve enhanced all-cap index performance. The ACT strategy seeks the massive diversification and “market” performance of the S&P® 500 index while adding value through stock picking in the small to mid-cap range of the equity universe. We normally strive to invest roughly half of the ACT strategy passively while selecting appropriate equities from our SMV strategy for the active portion of the portfolios. The actively managed portion of the ACT strategy employs PCM’s fundamental value approach.